The availability of clinical trials at Rush enables us to offer our patients the most innovative courses of treatment and latest potential breakthroughs. Triple-negative breast cancer, or TNBC, is an extremely aggressive form of breast cancer with no FDA-approved targeted therapies. However, a new class of immunotherapy drugs recently approved by the FDA for the treatment of melanoma and non-small cell lung cancer also show promise for certain patients with TNBC. April Swoboda, MD, and her team at Rush University Medical Center are studying the human microbiome — which describes the composition of bacteria and microorganisms living primarily within the gastrointestinal tract — as a predictive biomarker of response to these immunotherapy treatments. But it is unknown whether the microbiomes of patients with different breast cancer subtypes are distinct. Dr. Swoboda believes that response to new immunotherapy treatments for patients with TNBC could be predicted by a patient’s stool microbial composition. While there are some known risk factors for developing TNBC as opposed to other subtypes of breast cancer, Dr. Swoboda also believes that differences in patients’ gut microbiome might contribute to the subtype of breast cancer they develop. Furthermore, exploring the differences in the gut microbiome of black and white patients with breast cancer will add to the field’s understanding of why black women are more likely to develop and pass away from TNBC than are white women. To explore these hypotheses, she is collecting stool samples and analyzing the microbiome of patients with breast cancer. 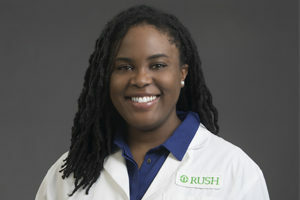 If a microbial signature is identified that correlates with an increased immune response in the tumor microenvironment, or a higher response rate to therapy, this will allow Rush to offer better treatment options for women with TNBC and, physician-researchers hope, increase the chance to better treat this challenging form of the disease.